Eugene W. Leganza, 94, of New Britain, passed away on Friday, March 29, 2019. A lifelong New Britain resident, he graduated from New Britain High School. He worked at the Fafnir Bearing Company for 37 years, first as a tool and die maker, then as a foreman in the press room. He was married to Florence Barszcz who predeceased him in 1986. They were married for 39 years. Eugene is survived by three sons, Richard, and John of New Britain, and Gene, who resides in Wilton Conn., with his wife, Theresa Brady. He is also survived by many nieces and nephews. During World War II he enlisted in the Navy and served from 1943-1946. He was a Machinist’s Mate 2nd Class on the destroyer U.S.S. 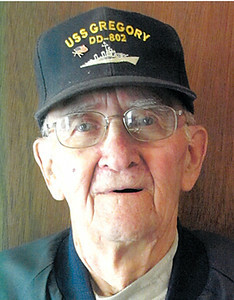 Gregory and saw action in the Pacific theater at Iwo Jima and Okinawa, where his ship was damaged in a kamikaze attack. The family thanks the staff of N5, C5, and Hospice Care at the Hospital of Central Connecticut, New Britain, for their excellent and loving care. Funeral services will be held Thursday, at 9:30 a.m. at the New Britain Memorial & Donald D. Sagarino Funeral Home 444 Farmington Ave., New Britain, followed by a Mass of Christian Burial at 10:30 a.m. in Holy Cross Church, New Britain. Committal with full military honors will follow in the Chapel at Sacred Heart Cemetery, New Britain. Visitation will be on Wednesday, April 3, from 5 to 7 p.m. For directions or to leave an online condolence, please visit newbritainsagarino.com. Posted in New Britain Herald, on Monday, 1 April 2019 20:01. Updated: Monday, 1 April 2019 20:04.